MCCASLIN - Jean Agnes (Hunter) McCaslin, 97, went peacefully to be with her Savior on Wednesday, January 25, 2012, in Ross Payant Nursing Home, Assiniboia, Saskatchewan. Jean’s favorite hymn and scripture were “I’d Rather have Jesus” and Psalm 37. 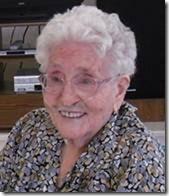 Jean was born August 31, 1914 to Jim and Ada Hunter on their homestead in the Connaught district south of Meyronne, SK. Her schooling began in that school, continuing at Bellmuir when the family moved to the farm south of Woodrow. One of her great joys was helping her Dad with farming, the horses were her favorites. Music played a large part in the Hunter family. Jean played the piano, sang and accompanied her brothers on their instruments. She also worked at the Kincaid Hospital prior to her marriage to Lloyd Abram McCaslin in 1939. Jean and Lloyd had 4 children: Ruth (Gordon), Walton (Ruth), Don (Bonnie), Gordon (Marlyss). As a busy farm wife, she also was part of the leadership in Homemakers Clubs, Kincaid Hospital Auxillary and Church ladies’ groups. League bowling at Meyronne Hall was a highlight for her following the death of her husband. Jean loved to read, as well as knit, crochet, do liquid embroidery, ceramics and tat. Tatted crosses were her ‘trademark’. Grandma Jean, as she was known to many, loved her children, grandchildren but when the Great Grands came along, that love knew no boundaries! Her biggest smiles and joyous giggles came when she was able to cuddle the little ones on her lap. Jean was predeceased by her parents, husband, brothers, Lloyd, sister in law Peggy and Lorne, son, Gordon, grandsons Michael and Ronnie B. She is remembered with love by her children, Ruth (Gordon) Omland, Walton (Ruth), Don (Bonnie) and daughter in law, Marlyss. Grandchildren/Great Grands, Ken (Nathalie); Carolyn (Garnet), Cameron, Anya Mei, Scott Harrison; Darcy (Annette), Clay, Alana, Chanel; Kevin (Tania), Katana, Paige, Sienna Jean; Nathan (Tina), Ezekiel McCaslin; Crystal (Kevin) James, Matthew, Alyssa, Micah Gregory; sisters in law Kay Hunter and Ruby Leitz; plus many ‘adopted children’. Memorial Service will be held on Saturday, February 18, 2012 at 2:00 pm, at the Woodrow Gospel Chapel, Woodrow, Saskatchewan. A reception will follow in the church basement, while a family burial service will take place at the Meyronne Cemetery. Memorial gifts may be sent to “Tribal Trails” Northern Canada Evangelical Mission, Box 3030 , Prince Albert, SK S6V 7V4; The Gideons International, or a charity of your choice. Funeral arrangements entrusted to Piché-Hawkins-Grondin Funeral Chapels, Assiniboia & Gravelbourg. Wife, Sister, Mom, Grandma, Friend – “You loved us”, Good bye.